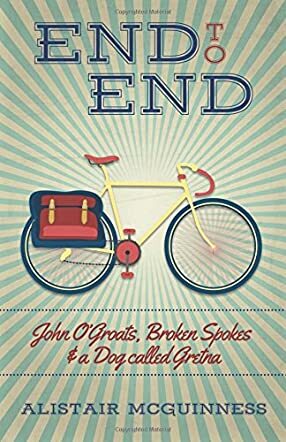 End to End: John O'Groats, Broken Spokes and a Dog called Gretna by Alistair McGuinness will enthrall readers with the author's travel adventures and stories. These started off with the author borrowing his brother's bike and pedaling with his two friends from Land's End to John O'Groats. The ride takes readers along with these three men to three countries, and includes some memorable experiences. And this ride changed the life of one of the riders forever. So let's join these riders to learn more about their interesting and adventurous journey that will become a game changer for their lives. I found the book fast paced and entertaining. It gives readers a peek into the small villages in the UK and also makes them realize that it's never too late to have an adventure. The narration is detailed and descriptive, making the incidents vivid. Many of the experiences shared by these bikers are real and palpable, making it easy for readers to connect with what they say. The book conveys a good message through the experiences of these three friends - to travel, to learn, to be respectful, to explore, the power of self-belief, and to laugh at the smallest things. The book is encouraging to all those who love traveling and who enjoy exploring and discovering old and new places. It also motivates them to try something different and meet all the challenges they face in life with a positive outlook.